Chevrolet, the General Motors vehicle brand, has been established since 1911. This Detroit-based auto manufacturer focuses mainly on passenger vehicles, such as small, mid size, and full size cars. Chevy trucks are usually developed alongside other General Motors trucks, such as those from the company’s GMC brand. Chevrolet vehicles, including Chevy SUVs, are designed and engineered in Michigan, in the United States, and are built in various production facilities around the world. Many current models are assembled in Flint, Michigan and Roanoke, Indiana in the United States, and also in Silao, Mexico. The Chevrolet Silverado is one such example of a long-running Chevy truck model. Although the series was introduced in 1998, the first Silverados were similar to the line’s predecessors, the Chevy C/K and Suburban models, which were in production from 1975 until 1999. Like its sibling, the GMC Sierra, the Silverado is available in a wide variety of configurations, including heavy duty models. The Chevy Silverado 3500HD is a heavy duty light truck that is offered in the same engine and transmission configurations as the Silverado 2500HD, but the 3500HD provides the added benefit of a stronger suspension and a dually twin rear wheel setup, which improves its towing and cargo carrying capabilities. 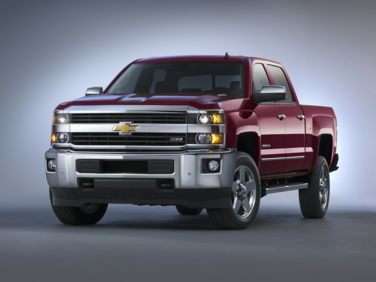 The 2014 model year Chevy Silverado 3500HD can tow up to 18,000 pounds and can carry a 7,222 pound load. These maximum ratings, however, are for the most powerful drivetrain available, and capacity may decrease when certain options are selected, most notably the addition of the four-wheel-drive system. The base engine for the Chevy Silverado 3500HD is a 6-liter V8 gasoline engine that yields 360 horsepower, paired to a six-speed automatic transmission. Trading up gets a 6.6-liter turbocharged diesel V8 with a heavy-duty six-speed automatic gearbox that features manual shift control, a combination that produces 397 horsepower and can accelerate from 0-60 in 7.5 seconds. For the 2014 model year, Chevy discontinued the 3500HD’s extended cab option, although it is still available with regular cab and crew cab configurations. The regular cab requires the long bed option, but crew cab buyers can choose between a standard and a long bed. In addition, the Chevy Silverado 3500HD is available in several trim levels, from the base model Work Truck trim to the well-equipped LTZ. The Work Truck trim comes equipped with 18-inch steel wheels, climate control, cruise control, a split front bench and folding armrest for additional cargo space, vinyl upholstery, and a trip computer. Some stand-alone options are available. The mid-level trim, the LT, upgrades to 18-inch alloy wheels, power accessories, keyless entry, cloth seats, driver-seat lumbar adjustment, a leather-wrapped steering wheel, satellite radio, a CD player, and General Motors’ OnStar onboard communications system. Ordering the LTZ trim requires buying the crew cab style truck, and it adds a heavy duty trailer system, a locking rear differential, dual zone climate control, eight-way power and heated front bucket seats, leather upholstery, remote start, an upgraded Bose audio system with USB and iPod integration, and Bluetooth wireless integration. Some trim levels offer standalone options such as rear parking sensors, tool boxes, an upgraded bed liner, a sliding bed divider, and a navigation system. There is also an off-road package and an exterior upgrade package.